One of the many aspects that draws me to fishing is that no two days on the water are ever the same. While experience and time on the water can improve the outcome of successfully catching fish, even the best of anglers are humbled at times and there is no end to learning and improving. I’ve spent most of my time over the years fishing on lakes, but have also enjoyed fishing on a few rivers. 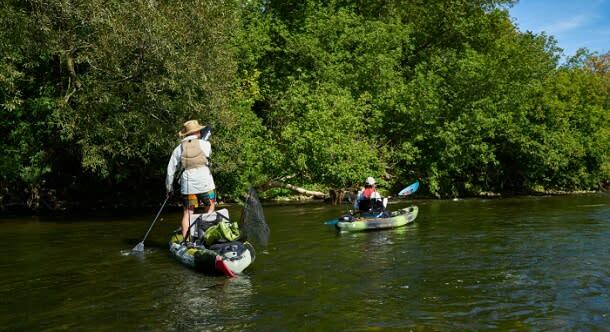 What is special about river fishing is that they change throughout the year with water levels, flow rates, and water temperatures rising and dropping. These changes are effected by the weather: how much rain we are getting, temperature, and seasonal changes. These factors effect the fish species that reside in these waters making for an even more unique experience as rivers are ever-changing. 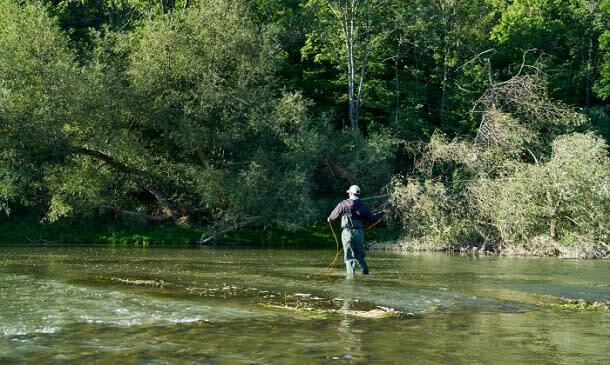 I recently had the opportunity to travel and fish in Ontario’s Southwest region, in Haldimand County and the Waterloo Region. It was a memorable experience which included three fishing adventures as well as staying with three different accommodators. There are lots of photos with this story! The adventure began on a Thursday evening when Eric and I hit the road from Ottawa to Caledonia. 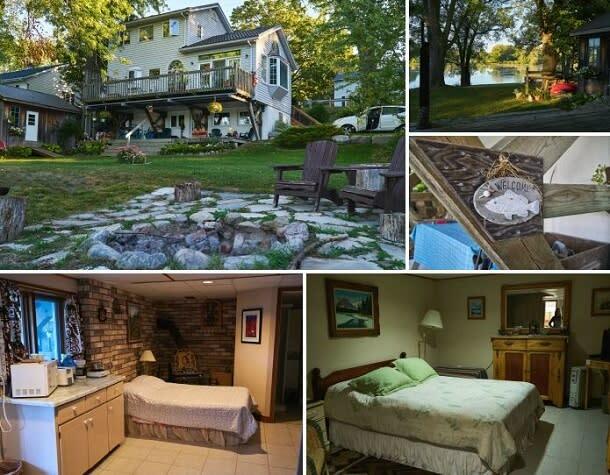 We stayed at the Heron House On The Grand which is a quaint bed & breakfast directly on the shores of the Grand River. Barbara Mead is the host and says many of her guests enjoy fishing right from her property. She has two rooms available with self-catered breakfast so guests can come and go as they please. There’s a fire pit and chairs to lounge in overlooking the picturesque river. We arrived quite late and were up early for the first part of our fishing adventure and Barbara was lovely and accommodating to our schedule. Our first fishing destination was just a short car ride to nearby Seneca Park where we met up with Peter Charles of Hooked4Life Fly Fishing. Peter has been fishing since the age of six with a lifetime of experience and is a Certified Fly Casting Instructor. He offers fly and Spey casting lessons throughout the year to both newcomers and experienced anglers. 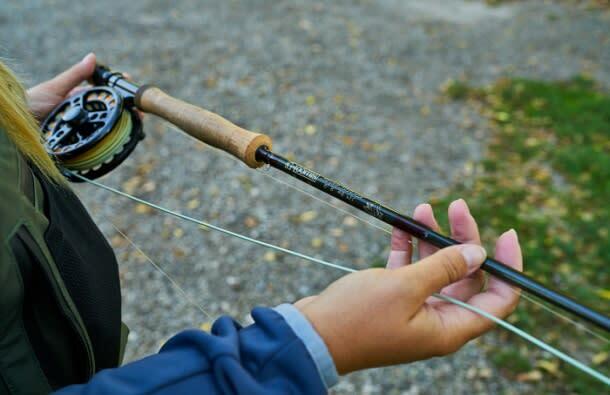 It had been awhile since I had picked up a fly rod so I was excited to shake the dust off and improve my skills with Peter’s guidance. There are few things in life as tranquil as standing in a river with water swirling around your waders while fly casting. It sure felt good to be at it again! Peter is a fantastic teacher and very enjoyable to share the water with. I made some improvements to my casting and learned some new techniques. He had some great fishing stories and I was pretty surprised at the variety of species he catches on the Grand River. From bass to steelhead, carp to freshwater drum, and more. We made our way back to shore after a great morning on the water and enjoyed a tasty lunch that Peter packed for us. We thoroughly enjoyed our fly fishing experience! Thank you so much, Peter! 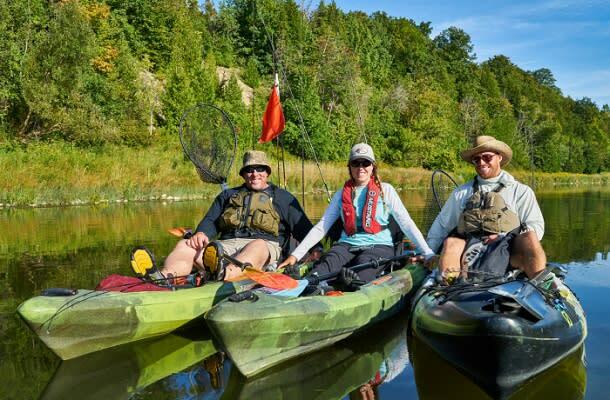 Up next was a kayak fishing adventure in the Waterloo Region with BAER Fishing Adventures! 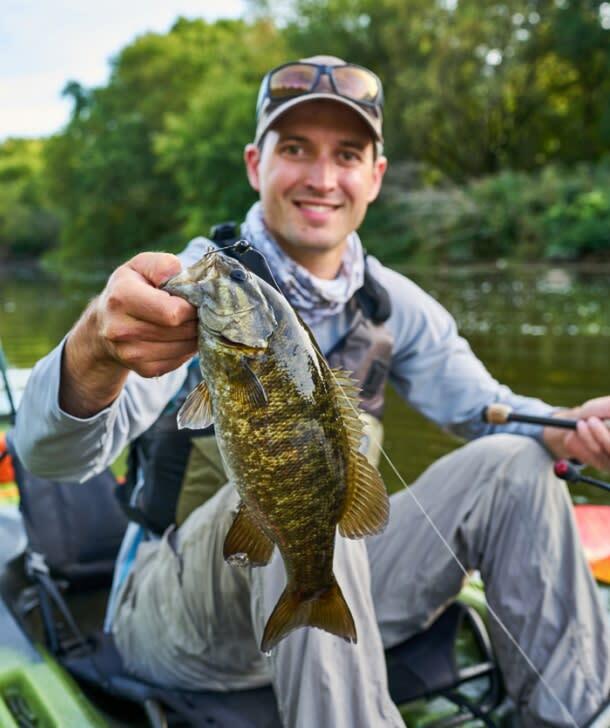 Barna Robinson is the owner/operator and has created a unique guiding service offering clients the opportunity to get out and experience kayak fishing. 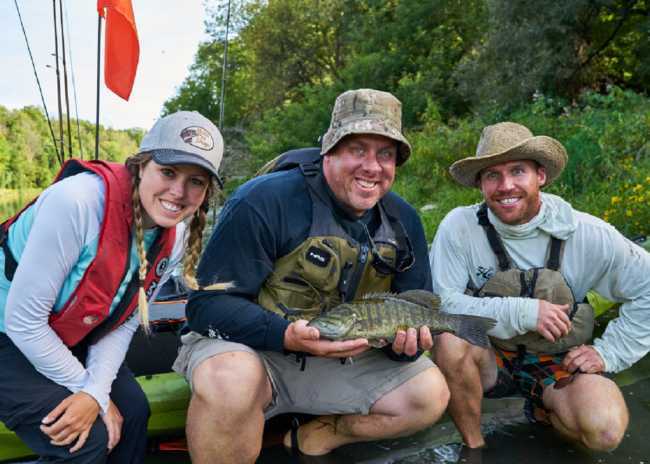 He and his team of guides each have different expertise enabling them to offer a variety of multi-species fishing experiences on various bodies of water. 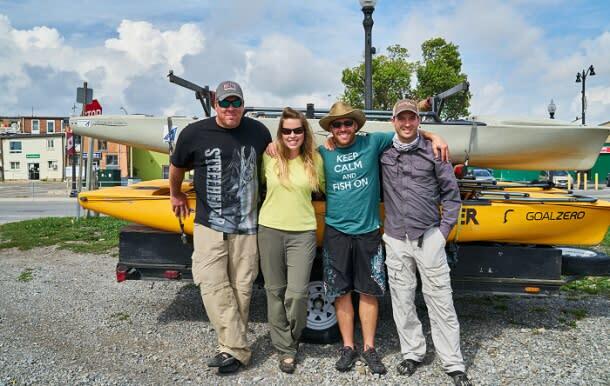 Barna’s clients range from experienced anglers/kayakers to those that have never participated in either. I’d met Barna in the past at the Toronto Boat Show and had been connected to him on social media so it was great to finally hit the water together! Those of you that may have been following my adventures over the years know that prior to owning a boat I had been fishing exclusively out of a kayak. I was pretty excited to get back into a kayak and experience fishing on this section of the Grand River. 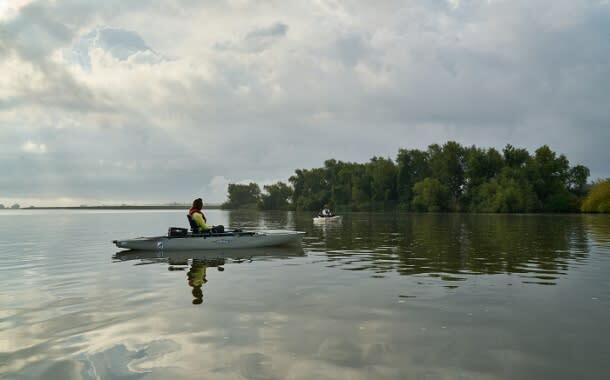 It was actually my first time using a paddle kayak for fishing (as I was previously in a Hobie Kayak which are powered by a foot pedal propulsion system). I didn’t have any trouble getting used to the paddle and it was fun zipping through the skinny water. In addition to Eric, Barna, and myself, we were also joined by Jason Barnucz. Jason guides for BAER and is a full-time biologist. It’s no surprise that Jason is extremely passionate and knowledgeable about fishing! I had met Jason at trade shows in the past and followed him on social media so it was wonderful getting to share the water with these guys! 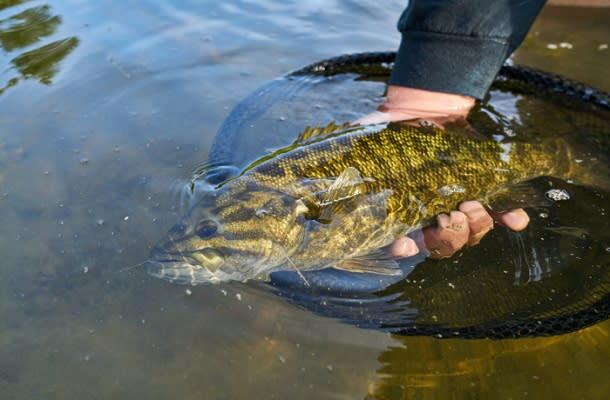 We covered about 9-kilometers of the river and our targeted species was smallmouth bass. Jason shuttled the kayak trailer & van prior to our trip down the river so that we could fish all the way until dark and not have to paddle our way back up. There are shuttle services in the area that will transport you back to your vehicle or move your vehicle down the river for you. The kayaks we used were perfect for this type of water as we were able to maneuver them through even the shallowest of sections. It was pretty amazing to float down the river with the current and paddle around with such gorgeous scenery around every river bend. Here’s a link to a live Facebook video we did from the water. We caught SO MANY SMALLMOUTH! It was a riot! We used a few different presentations including: shallow diving crankbaits, small spinnerbaits, and senkos (on the Ned Rig). After arriving at the launch and packing up our gear, Jason drove us back to our vehicle and we headed to Kitchener for the evening to stay at Holiday Inn on Fairway Road South. The accommodations were very nice and quite modern. The food in the hotel restaurant was delicious!! We slept like babies after a day of paddling around! We definitely recharged our batteries here. The following day had some nasty wind, rain, and thunderstorms making it unsafe to get out on the water so we had a day off. We caught up on sleep, and headed to Dunnville for our next adventure which would take place the following morning. Dunnville is known for…Muddy the Mudcat! 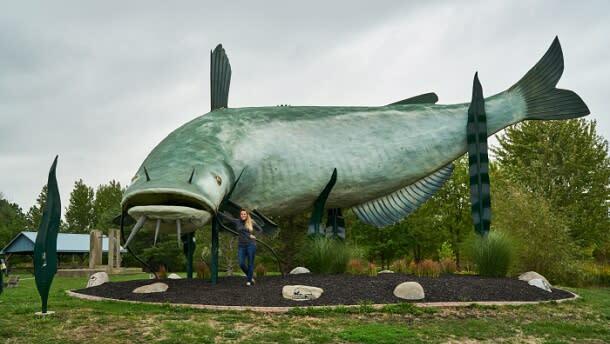 I had heard about the giant channel cats found in Dunnville over the years as it’s a well known fishery and couldn’t wait to get a shot at catching some! We checked in to our final accommodation of the trip and were quite honored to be the first official guests at this brand new (and newly renovated) B&B called The Reeve Bed & Breakfast. The building is a heritage landmark dated back to 1869. The owners, Lisa and Luke Rossi, have done an outstanding job turning the place into a comfortable home away from home. 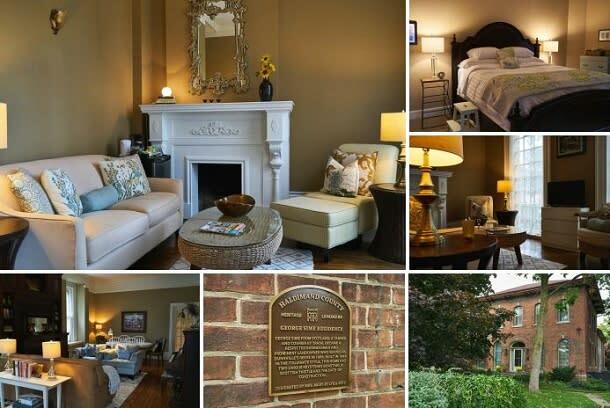 Each room is so thoughtfully decorated, it all looks to be straight from a magazine! We were very impressed and settled in nicely. Eric took a nap and I watched some Netflix. We were up early the following morning for our catfish adventure so Lisa packed us the most delicious brown paper bag breakfast I’d ever had! Often when I’m fishing I live off granola bars for breakfast but she provided us each with quiche, yogurt, and grapes to start our day. Thank you Lisa and Luke! All the best with your B&B! We met with Barna and Jason just a few minutes away at the public boat launch in downtown Dunnville. We fished until around noon and unfortunately didn’t land any channel cats this time. We still had a blast and got to see a few getting reeled in by some anglers anchored down in a nearby boat. They were massive! It just gave us a reason to make another trip back and get some catfish redemption next year! A huge thank you to Barna and Jason for providing us with such a memorable adventure on the Grand River! We loved this trip and can’t wait to visit again and fish with you guys! It was a blast! 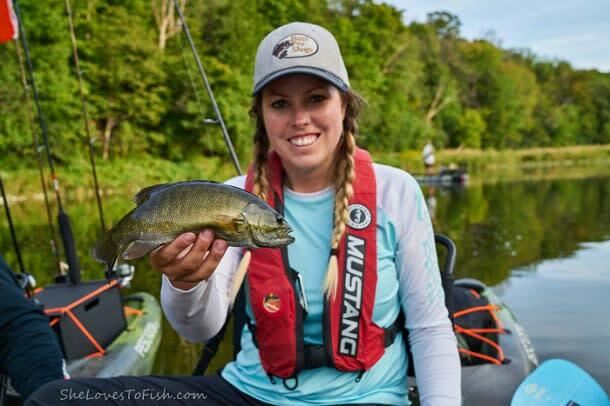 To read more of Ashley Rae&apos;s fishing adventures, please check out her website here.